NEW Emerge/Evolve 2018: A Showcase of Rising and Evolving Talents in Kiln-Glass Bullseye's tenth international exhibition for emerging artists in kiln-glass, documented in an elegant full-color catalog. Artist statements and bios of winners and finalists. Introduction by Lani McGregor. Interview with jurors Benedict Heywood, Heidi Schwegler, and Diane Wright. Plus Evolve 2018, a companion exhibition celebrating three former Emerge finalists whose subsequent work expands the medium: Joanna Manousis, Cassandra Straubing, and Kathryn Wightman. 2018, soft cover, 52 pages, color. 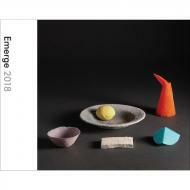 Exhibition catalogs for past Emerge competitions (2016, 2012, 2010, 2008, 2006, and 2004) are also available.